The biggest issue when cooking sausage and peppers is cooking the sausage through without splitting the casing, over cooking the inside, or burning the outside. Through lots of practice I can usually cook the sausages pretty good but I still have to pay close attention, especially at the end of the cooking time. Using sous vide sausages has removed this difficulty and the sausages always come out moist and perfectly cooked! I still grill the sausages and get the great flavor and browning but I pre-cook them in the sous vide bath. That means I just have to brown the outsides and they're good to go. I can now pay attention to other things going on around me instead of focusing only on the sausages. Having the sous vide sausages already cooked also makes it easier for me to get the peppers and onions cooked through and still hot when it's time to serve. Making sous vide sausage is about as easy as sous vide can get. You simply seal the sausages in sous vide pouches and cook them for 1 to 2 hours at 131°F for beef sausage or 140°F for pork sausage. Take the sausages out of the sous vide pouches and pat them dry. They look like they're still raw at this point but in fact they are cooked all the way through. They are now ready to throw on the grill when you're getting close to eating. 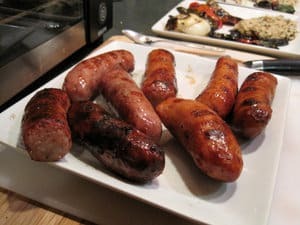 The sous vide sausages are fine sitting for 15 to 30 minutes before going on the grill. Once on the grill the sous vide sausages only take about 1 minute per side to brown them. They're then ready to serve! For sides you can serve pretty much anything that goes well with sausage. 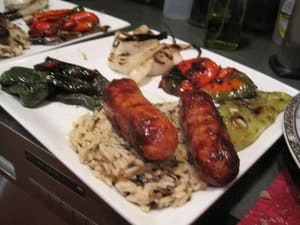 With our sous vide sausage I did grilled sweet peppers, poblano peppers, and onions fresh from the garden and some wild rice. You can also use the grilled sous vide sausages in hot dog rolls for a great sausage roll. If you would like more information about the modernist techniques, ingredients, and equipment used in the Sous Vide Sausage and Peppers you can check out the following. Place the sausage links in the sous vide pouches. Seal the pouches then place in the water bath and cook for 1 to 3 hours. About 5 minutes before the sausage is done place the onions and peppers on the grill. Flip them as the skin begins to char. They are done when they are tender and begin to soften. Remove the sous vide sausages from their pouches and pat them dry. Quickly sear them on two or three sides on the grill over high heat, about 1 minutes per side. 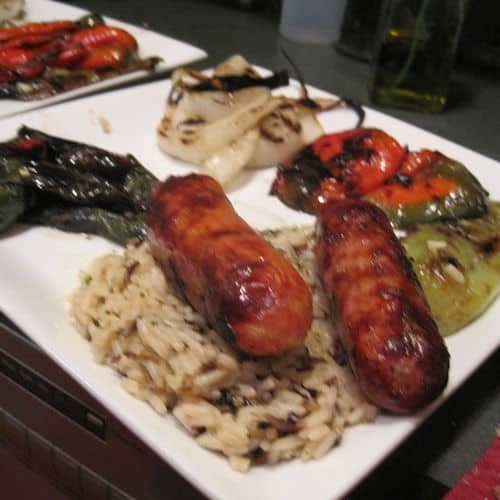 Remove the peppers and sous vide sausages from the grill and serve. Using sous vide sausages has removed this difficulty and the sausages always come out moist and perfectly cooked.